Two large companies make very small compact cameras with very big specifications: Panasonic and Sony. Both companies make cameras that feature 20mp 1" sensors, both fit in a reasonably small shirt pocket, and both have a wide-angle to telephoto superzoom that extends out from the small body when you power the camera. This review compares the Sony RX100 Mark VI with the Panasonic ZS200. Both cameras have built-in EVFs to act as viewfinders (the Sony's pops up, the Panasonic's is fixed in place), in addition to the usual 3" LCD out back (the Sony's LCD swivels, the Panasonic's is fixed in place). Both cameras have a pop-up flash, too. Neither camera comes with a traditional battery charger (they both use USB charging in camera). The Panasonic entry is the Lumix ZS200. The 24-360mm lens is f/3.3-6.4 (partly extended, above). The price is US$800. The Sony entry is the RX-100 Mark VI. The 24-200mm lens is f/2.8-4.8 (fully extended, above). The price is a whopping US$1200. Both cameras have a thin metal alloy shell (not a frame, per se). The Lumix has a slight hand grip with a rubber strip while the Sony comes out of the box in the usual slippery soap bar fashion (you can add a small rubber grip; why Sony makes that an option on a US$1200 camera is silly). The Panasonic weighs in at 340g, the Sony at 301g. The Panasonic has a macro mode that reaches to 1.2" (3cm), with a normal focus minimum of 20" (50cm). 49 focus points cover most of the capture area. The Sony focuses to 3.2" (8cm) at wide angle, 40" (1m) at telephoto, and has 315 autofocus points over most of the capture area. The EVF on each camera is a bit different. Panasonic uses a field-sequential LCD arrangement, which can visual artifacts in the viewfinder (some call it the "rainbow effect"), while the Sony uses a full refresh OLED, which doesn't. The Sony's EVF is brighter, and has a slightly higher magnification (.59x versus .53x), too. Meanwhile, the rear LCD is a somewhat clear win for the Lumix, despite the fact that it doesn't tilt as does the Sony. That has to do with touch. Sony's touch implementation is pretty much limited to a very slow touch focus, while Panasonic has much more fully implemented touch, and it's far more responsive and useful. Both cameras top out at 1/2000 with their mechanical shutter, but will go to 1/16000 with electronic shutter. Neither has a built-in ND, which is a bummer. Both have a native ISO range that starts at 125 and goes higher than you'll be able to tolerate in shooting (12,800). Both cameras offer 4K video, but they accomplish that differently. The Sony samples the full width of the sensor and downsizes, the Panasonic crops 1.5x to the central field. This produces a huge set of advantages to the Sony, with one tiny exception: heat build-up. As with all previous Sony RX-100's, you're going to have issues with running 4K video for very long—it's limited to 5-minute clips—especially on hotter days. The Sony does offer some Log and other features that the Lumix does not. Meanwhile, the Panasonic is doing the equivalent to using a smaller sensor when it shoots 4K, and this has noise implications in low light. You also now the equivalent of a 36-540mm lens. If you were to use both cameras for 1080P video, the differences between them start to disappear, though the Sony still has a bit of an edge. The Lumix manages 1080P/60 at 28Mbps, and has a built-in time-lapse function. The Sony will match that and doesn't shoot time-lapse directly. The Lumix can record slow motion at 120 fps, but the Sony also can record slow motion at 240, 480, and 960 fps (though with visible issues as you increase the frame rate). The Panasonic's battery is rated at 370 shots (CIPA) and seems to do a bit better than that. The Sony's battery is rated at 210 shots (CIPA) and sometimes seems to do worse than that. The Panasonic's size is 4.4 x 2.6 x 1.8" (111x66x45mm). The Sony works out to 4 x 2.3 x 1.7" (102x58x43mm). That allows the Sony to slip into somewhat smaller pockets than the Panasonic, but I really don't feel constrained by the Lumix's slightly larger size. The two cameras are surprisingly similar in terms of basic controls. Both use a toggle zoom control around the shutter release. Both have mode dials. Both use the ring around the lens for (user customizable) control. Both have the usual Direction pad plus button cluster inherited from a lot of compact camera designs. The Panasonic's unique handling comes in several ways. (1) You can assign AF-On to a convenient button (AF/AE lock, a button the Sony doesn't have), and there's more configurable buttons overall; (2) the touch implementation on the Panasonic is complete and fast; you can run the menus from touch, too; (3) there's no fiddling to get the EVF active, just put the camera to your eye (under default settings). Overall, the Panasonic feels a bit more "real camera" like than the Sony. It's just easier and quicker to customize and change things on Panasonic, and a sophisticated user can throw a bit more control into buttons and dials. The Sony's unique handling comes in several ways: (1) the EVF/LCD are a bit more flexible; by having the pop up/push down EVF the camera a little slimmer in the pocket, and the tilt LCD is very useful when not using the EVF; (2) the RX100 mostly matches the menus of the bigger Sony cameras, so if you're using an A7 series camera as your main camera and the RX as your pocket camera, you have an immediately recognizable and similar menu system; (3) the Sony is "simpler" because it doesn't have a lot of customizable and extra buttons; the set, point, and shoot crowd probably will favor this. Battery: I've done enough shooting with these to say that the Panasonic seems to eek out more shots per charge than the Sony. That's a bit surprisingly considering the active touch display, but it seems consistent across my shooting. But neither camera is a barn burner in terms of shots per charge. I have more experience with the Sony RX series at this point, and they pretty much all only get me into the 200 shots/charge range. That small NP-BX1 battery is the issue. It's 4.5 watt hours versus the Panasonic's 7.4. It doesn't matter which camera you choose: buy extra batteries. I regularly carry a small ThinkTank battery holder with four extra charged Sony batteries in it, and I opted to buy a dual battery charger, as well, since I just seem to empty Sony batteries fast. If I were keeping the Panasonic, I'd probably opt to carry two or three extra batteries. Buffer: The winner here is the Sony, but only if you're using the electronic shutter. Basically you can run the camera at 24fps and get 150 JPEG+raw frames stuck into that buffer. The Panasonic can't come close to either number at 10fps and 60 JPEG frames (28 raw), which is about where the Sony is with the mechanical shutter. You can shoot at 30 fps with the Panasonic, but that's only at an 8mp photo size. Focus: the Panasonic is fast, faster than you generally expect from compact cameras, as it uses Panasonic's DfD (depth from defocus) method. But the Sony is state-of-the-art fast (for compacts and mirrorless, not necessarily DSLRs), as it has in-sensor phase detect. The Panasonic can kind of track moving subjects at its max 6 fps (it can do fixed focus at 10 fps), but the Sony does very credible tracking at even 24 fps. Both cameras have excellent face detect, but the Sony adds eye detect, and that gives it a slight edge in getting focus right for people. Both cameras have issues in autofocusing in my torture test. What's that, you ask? Shooting out an airline window at cloud formations, particularly in early morning or early evening light. The Panasonic rarely found anything it wanted to focus on other than the window, and was abysmal at the telephoto end. The Sony did better, but still sometimes struggled at the telephoto end. Neither camera could focus on the foreground clouds. The Sony had no issues with the far (lit) clouds at wide angle, struggled a bit at telephoto. The Panasonic never got a solid focus confirmation. Image quality: The lens performance of the Lumix lets it down, big time (which seems strange for something with Leica's name on it). I tried two copies of the ZS200 and found differing lens performance on each—which is an issue in itself—but neither really retained acuity across their focal range. The Sony doesn't have this problem. If anything, my Mark VI is better than my Mark V in some ways across the equivalent wide angle range, which is quite welcome. And closer we get to the corners, the more I see astigmatism, which is worse on the right side of my sample than the left. Having 360mm isn't useful if this is the level of detail you get. Unfortunately, that seems to be what you get in almost every circumstance at the telephoto end. Overall, the Panasonic is just outshot by the Sony, pretty much in every which way I could test them optically. I was enough disturbed by this that I got a second sample of the Panasonic to verify. It, too, was poor compared to the Sony, but in somewhat different ways. For the RX100m6 the bad news is that the only place where the Sony lens is reasonably fast is f/2.8 is 24mm (equivalent). That quickly raises to f/3.5 and f/4 and eventually to f/4.8 as you zoom in. 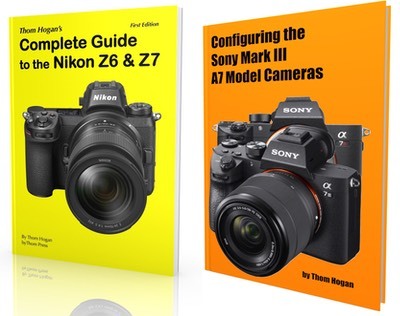 Thus, noise can become an issue when you compare the 24-70mm equivalent ranges of the RX100 Mark V and Mark VI models. Once you start applying noise reduction to a 70mm Mark VI image, you may be better off with the 70mm on a Mark V. But at wide angle in good light, I prefer the Mark VI at 24mm. More on this in a bit. It doesn't help matters that Panasonic's noise reduction for JPEGs is on the heavy-handed side. Detail becomes mush when the NR routines fully kick in. So I'm left with the impression that the Panasonic is producing images that are just a bit on the muddy side when looked at closely. Certainly what comes out of the ZS200 is very acceptable for social media use, but if you think you're going to get what the 20mp implies, no, think again. The Sony, meantime, doesn't have a lens problem, and has a much more nuanced and capable noise reduction. If anything, this is the best lens Sony has put on an RX-100 in terms of edge-to-edge sharpness, and central sharpness is no slouch either. Of course, f/4.8 and a 1" sensor does mean we're dealing a bit with diffraction impacts at the telephoto end, but still, the telephoto details on the Sony just blow away the Lumix on my samples. So what happens when you shoot JPEGs is this: you decide you need to zoom in for some reason. You're not in bright light, so that will mean you need to crank up the ISO to deal with the smaller aperture. The Lumix gets let down by lens sharpness, lens aperture, and noise reduction. The Sony doesn't suffer from lens sharpness issues, it has a faster aperture, and its noise reduction isn't as heavy-handed. So what you find is that the Sony images may have a bit of granular noise to them, but they look more detailed and sharper. What I ended up deciding is to keep both my Mark V and Mark VI RX100 models. The Mark V comes out when low light is the challenge, as that faster lens can keep me from dialing up ISO values. The Mark VI is definitely better if there's enough light to power it, though. I've shot with the RX100 models since they first appeared as my shirt-pocket camera, so am very familiar with what they can and can't do. The Mark VI impressed me as having the best lens yet. But you'll want enough light to power it, or else the Mark V—which has a very good lens—is going to probably give you the better final image in the 24-70mm range. Of course, the Panasonic uses a bigger battery and doesn't seem to have the heat built-up problem the Sony RX100 models do for long video takes, so it's not a 100% clearcut Sony win. That small Sony battery is very frustrating. When I travel, I carry a small pack with four extra Sony batteries and a dual charger, because I know I'm just going to plow through batteries. Still, here's what I say: pay the extra bucks and get the Sony. But you're going to keep spending ;~). You need to add the Sony grip, some extra batteries, and a real charger if you use the RX100 for any amount of shooting. And again: am I going to give up my Sony RX-100m5 now that I have the RX-100m6? No. Across the 24-70mm (equivalent) focal length range the Mark V has a stop-and-a-third advantage over the Mark VI. That's enough to make it my indoor/low light shooter. Plus, if you're doing video, you're going to overheat these beasts, so just switch cameras ;~). Of course that means I need a shirt with two pockets (and a deeper wallet pocket ;~). Of course, there is a US$400 difference in price between cameras you have to factor into all this. The Panasonic is more in the price range you probably expect to pay for this sort of camera, while the Sony is up in the sophisticated DSLR price range. If you're just looking for a convenient camera to use for posting to social media, the Panasonic starts looking far better (its smartphone to camera link is better than Sony's, too). If it's image quality and overall capability you're looking for, though, you need to pay the piper—literally if your dealer's name is Piper—and opt for the Sony. Had the Panasonic's lens been better, I might not be writing that. Both companies missed a mark here: both would be much more useful for vlogging if they had a microphone jack. These cameras are a great size for a small handheld gimbal, but they'll be let down by their audio quality. Likewise, not having a filter thread on the front of these cameras now that neither has a built-in ND filter is also a mistake. A US$1200 camera should not have compromising design mistakes like that. And once again, Nikon's missing DLs highlight something. Personally, I'm carrying both the Sony RX100m5 and RX100m6 models around now. Why? Because there are times when the faster lens of the m5 model at the wide end is much more useful. We gain more than a stop of data capture ability with it over the same low-end focal range as the m6. But then, there are times when the extra telephoto reach of the m6 is more useful. So, two cameras. Which was sort of the Nikon DL 18-50 and 24-85 idea, though there was a lot of overlap in those two and we would have substituted wide angle use for telephoto reach. Still, the notion of ICC (as opposed to ILC ;~) is definitely something that many of us are looking at these days. Now if we can only get Sony to make an RX100m7 that has an 18-35mm lens to go with my other two models (do they make shirts with three pockets? ).